This chapter describes the key features of JMS Simplified API defined by the Java Message Service (JMS) 2.0 specification. It also describes how it is implemented for creating JMS applications for WebLogic Server. The JMS 2.0 simplified API provides the same basic functionality as the JMS 1.1 API (classic API), but the new interfaces and several API changes make it easier to use. ConnectionFactory—An administered object used by a client to create a Connection. This interface is also used by the classic API. JMSContext—An active connection to a JMS provider and a single-threaded context used to send or receive messages. JMSProducer—An object created by a JMSContext to send messages to a queue or topic. Figure 5-1 shows how these objects fit together in a JMS client application. For more information about the JMS 2.0 interfaces, see the javax.jms package documentation at http://docs.oracle.com/javaee/7/api/javax/jms/package-summary.html. The main interface in the simplified API is JMSContext that combines the functions of the Connection and Session objects of the JMS 1.1 API. 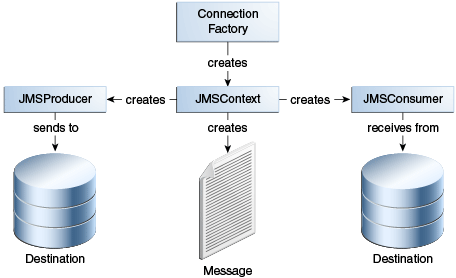 Creating a single JMSContext object eliminates the need of creating a connection, session, and a text message separately. For more information about the JMSContext interface, see http://docs.oracle.com/javaee/7/api/javax/jms/JMSContext.html. The WLJMSContext interface in the weblogic.jms.extensions package defines the fields and methods that are not supported by javax.jms.JMSContext. It provides the same extension features as WLConnection and WLSession. See the Javadoc for WLJMSContext in Java API Reference for Oracle WebLogic Server. To send messages in the simplified API, use a JMSProducer object. You can create a JMSProducer object by calling the createProducer method on a JMSContext object. You need not save the JMSProducer object in a variable. It is recommended that you create this object when sending a message. For more information, see Sending Messages Using the Simplified JMS API. For more information about the JMSProducer interface, see http://docs.oracle.com/javaee/7/api/javax/jms/JMSProducer.html. The WLJMSProducer interface defines methods and attributes specific to WebLogic JMS. You can use these features by casting the JMSProducer instance to WLSJMSProducer interface defined in the weblogic.jms.extensions package. See the Javadoc for WLJMSProducer in Java API Reference for Oracle WebLogic Server. The JMSConsumer object receives messages from a queue or topic. You can create a JMSConsumer object by passing a Queue or Topic object to one of the createConsumer methods on a JMSContext or by passing a Topic object to one of the createSharedConsumer or createDurableConsumer methods on a JMSContext object. For more information about the JMSConsumer interface, see http://docs.oracle.com/javaee/7/api/javax/jms/JMSConsumer.html. In addition to the methods for sending and receiving messages on JMSContext objects, JMS 2.0 introduces a few more methods to simplify the code. The getBody method provides an easy way to obtain the body from a message. This method applies to both classic and simplified API. The receiveBody method can be used to receive any type of message except for StreamMessage and Message, as long as the class of the expected body is known in advance.